May 27th is World MS Day 2015. And the theme is "breaking down barriers to living with MS". That's a mighty tall order - however, it is possible. 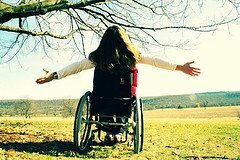 Barrier-free living is a relatively new term, but it's been a necessary one for so long. Over the years we've run into so many barriers as we tried to navigate our world with Cir in a manual wheelchair, power chair, or scooter. Years ago, providing wheelchair accessibility wasn't even considered. People with mobility issues stayed home. They were hidden away where no one could see them. Every once in a while they would venture forth, but because of all the obstacles - having to be carried or lifted over, around - it was easier to watch the world go by your window or on TV, or listen on the radio. Even living in their own homes presented problems when doorways weren't wide enough or stairs kept them confined to one area. Makeshift ramps were constructed in order to get a wheelchair bound person in and out of the house and into a garden for a few hours a day. I have a vague memory of a huge wheelchair (I was very young) sitting in the front hallway of a relatives home. There may have been a ramp, however, I doubt it. Unfortunately, people with mobility problems simply made do and suffered in silence - or maybe not. With the passing of the ADA of 1990, some of those barriers were torn down. "Oh, people in wheelchairs would like to get around freely? They would like to eat in restaurants, go to the library, shop - independently? Oh, okay..., now what?" We were so excited to see cut-aways being built on each corner in our neighborhood several years ago. We took full advantage of them by going for frequent walks when the weather was warm. Now, when we run across a sidewalk that's not cut-away, it's a shock. The barriers to people living with MS are not just physical, either. There are people who still believe that when you don't look sick, if you just pushed yourself a little harder, you would get better. If you got more rest... If you took more vitamins... If you did _______ more... (you fill in the blank), everything would be better. And I'm not saying that doing certain things won't help. Making better life choices will help, but in and of themselves, no. Not in the way that they are being presented to you, the person living MS by many times "well-meaning", however, incorrect friends or family. Some people may have a set idea of what we mean when we talk about access in the context of Multiple Sclerosis. They may presume that access refers to access to medicines, or disabled access. Neither of these is wrong, but there is a wide range of barriers to access faced by people with MS around the world. When we talk about equality of access for people with Multiple Sclerosis we mean access to a social, political and economic life. Equality of access doesn't just mean physical access to buildings, but to access to the same tools, services and facilities that people who do not have MS enjoy." What CAN we do for World MS Day 2015? How can we continue to break down the remaining barriers to people living with MS? There are so many ways to help. Making people aware is probably the biggest barrier. It seems so odd when Cir tells someone he meets that he has MS and they have no idea what it is. Most people can relate in a small way because they know of a relative, friend, neighbor, or other acquaintance, who has or had it. If you don't live with someone who has it, though, it's almost impossible to relate. And even then, it's easy to feel like the person with MS is not doing everything they could be doing to get better. So how can we break down the barriers? Here's a list that in no way is complete. There are as many ways to help as there are people willing to make the effort. You can find a list of events happening Around the World on the World MS Day site (opens in a new window). If there's nothing in your area, there is still time to come up with something. And that's just the tip of the iceberg. Add whatever you like to each of those actions to help break down the barriers you see holding back the people in your life who live with MS.
Go from World MS Day 2015 to the blog.